In a recent report the Israeli human rights organisation B'Tselem accused the Israeli government of effectively annexing the Jordan Valley - a large strip of land which makes up at least a quarter of the occupied West Bank. UN officials have also told the BBC they are concerned that the region is gradually being cut off by restrictions imposed on the Palestinian population by the Israeli security forces. Our jeep plunges down a steep, winding road from the hills surrounding Jerusalem towards the Jordan Valley. It is a descent of more than 1000 metres through deep gorges to the lowest point on the planet. Israel occupied the West Bank in the 1967 war. Palestinians hope that the whole of the West Bank and East Jerusalem will be returned to them as part of any peace deal creating a viable independent state which would also include the Gaza Strip. But before we can enter the valley we have first to get through an Israeli military checkpoint - one of seven controlling access to and from the region. The soldier on duty quite openly tells us about the restrictions now being imposed on the Palestinians when we ask him whom he allows through. "Only the ones who live nearby, all those villages nearby," he says. "But the ones who do not live here but in Ramallah or Bethlehem, they cannot pass through here." This backs up the findings of the human rights organisation B'Tselem that only Palestinians listed as residents of the Jordan Valley can enter the area. Everyone else must have a special permit even though it is part of the West Bank. In another telling answer, the soldier describes Palestinian labourers entering the Jordan Valley to work on Israeli settlements as "coming to work in Israel... these settlements are not in the West Bank". For him the Israeli annexation has already happened. "The Palestinians cannot use the Jordan Valley," says Najib Abu Rokaya, B'Tselem's fieldwork co-ordinator. "It's one third of their small, poor homeland and it is closed in their faces." We drive on into the Jordan Valley and head north along the main highway until we reach a small Palestinian village. We're invited to drink tea outside with some of the local people and soon one man called Faris starts telling his story. He owns land and a house in the village but his identity card shows that originally he comes from a town just outside the Jordan Valley. He says the Israeli security forces have therefore been throwing him out as an illegal resident. "The soldiers arrested me and handcuffed me until my brother came. Then they transferred me to the checkpoint and left me there. It's happened to me five or six times." "They've been checking the IDs of people here for the last two years." Later we walk over to a house on a hill overlooking the village. Inside lying on a mattress on the concrete floor lies a heavily-pregnant woman, surrounded by her three children. She's sick. But like Faris her identity card shows that originally she's from another part of the West Bank . "I'm afraid to go out," she says, "I've been sick for two months and I haven't even gone to the doctor." "I am afraid that I could meet an army patrol and they could ask for my ID." She's terrified she would then be forced to leave the valley and be separated from her family. 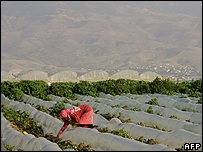 The Jordan Valley is a fertile part of the West Bank and fruit, vegetables and flowers are all grown here. But the restrictions on movement mean Palestinian farmers are now having problems selling their produce. A farmer called Jamal tells us traders from the West Bank can no longer enter the region and if he sends his produce by truck to the market in Jenin it often arrives in bad condition because of delays at the checkpoints. Back in Jerusalem at the end of our journey, an Israeli military spokesman agrees to speak to us. He flatly denies any new restrictions have been imposed on the Palestinians recently. He says the only restrictions came into force five years ago and apply to Palestinians wanting to use the main north-south highway in the Jordan Valley, Route 90. He adds that the checks were imposed because of the access the highway would give to would-be suicide bombers. But United Nations sources agree with B'Tselem about what is happening in the region. "It is part of [Israel] establishing its borders," says one UN official, "and setting facts on the ground before a peace agreement is reached with the Palestinians." The acting Israeli Prime Minister, Ehud Olmert, recently stated that the Jordan Valley would not be handed back to the Palestinians and instead would form part of Israel's eastern border with the Arab world. 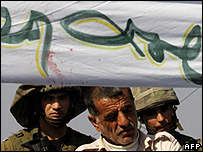 The Israelis have always viewed it as vital for the defence of the country. Without it they believe Israel would be extremely vulnerable and not just to invasion by Arab countries. "The great danger to Israel would be if al-Qaeda elements that are today in Iraq and are already penetrating Jordan and Syria, would be able to marry up with a Hamas regime in the West Bank," says former Israeli government adviser, Dore Gold. "By holding the Jordan valley, Israel can make sure that Zarqawi in the East doesn't join forces with Hamas in the West." Apart from the Jordan Valley, the Israeli government also recently announced that it wanted to keep all the major settlement blocks in the West Bank. According to the human rights organisation B'Tselem, that would mean in total around 40% of the West Bank would remain in Israeli hands.